There’s no denying it: there’s just something special about being a dog dad. In the spirit of Father’s Day, we teamed up again with our friend, illustrator Natalie Marion, to explore the silly, sweet, simple world of The Dog Dad. 1. This is how they wake up. It takes several snoozes, a slew of sloppy smooches, and sometimes, a shoe. 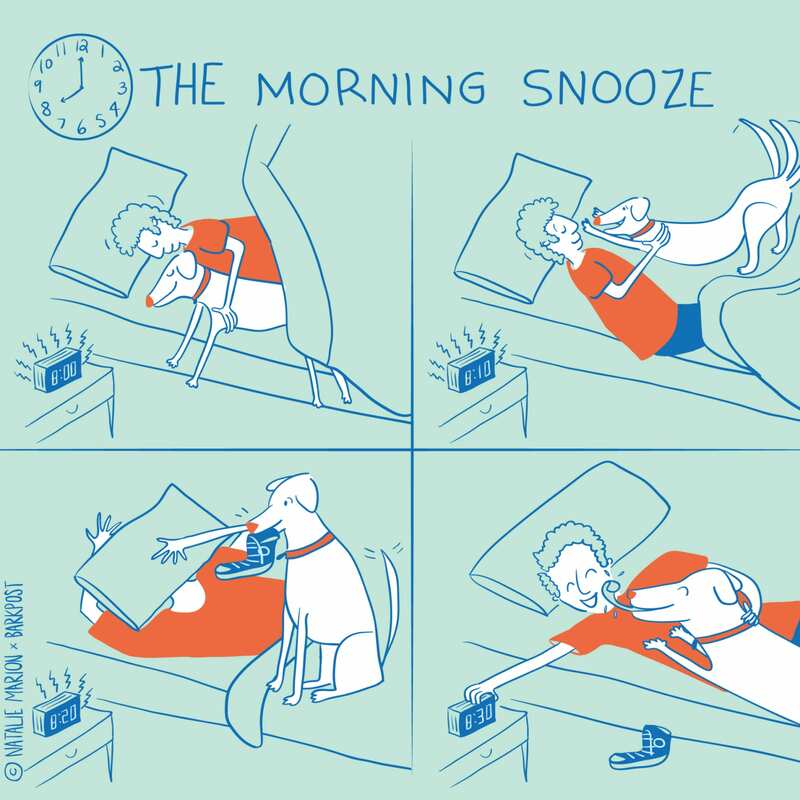 But eventually, dog dads will get up and start their day. 2. This is how they poop. Unlike waking up, this usually goes pretty smoothly. 3. This is how they do their chores. Many hands and paws make light work. But also good thing this guy’s got a dishwasher. 4. This is what it looks like when the zoomies take over. This happens several times during the day, but we’re just going to show it once. Enjoy. 5. This is how they work from home. As long as there’s a laptop within arm’s reach, it’s technically still work. 6. This is how they answer emails. What? Those emails aren’t going anywhere. 7. This is how they create and then cancel plans. It feels good to make plans. It feels even better to cancel them. 8. This is how they (try to) flirt. Sometimes father doesn’t know best. But he’ll learn one day. Maybe. 9. This is how they “watch” the big game. Eh, whatever. SportsCenter will have highlights literally all day tomorrow. 10. This is how they go to bed. It’s been a long day. And a really good one.